This book provides practical and buildable solutions for the design of foundations for housing and other low-rise buildings, especially those on abnormal or poor ground. A wealth of expert information and advice is brought together dealing with the key aspects a designer must consider in order to achieve effective and economic foundation designs. This second edition of Structural Foundations Manual for Low-Rise Buildings has been completely updated in line with the new government guidelines on contaminated land and brown-field sites. 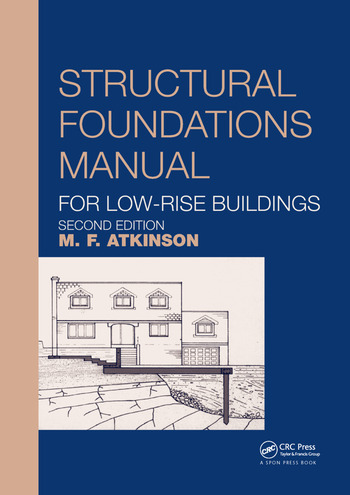 The book includes well-detailed design solutions and calculations, actual case histories, illustrations, design charts and check lists, making it a user-friendly reference for contractors, structural engineers, architects and students who have to deal with foundations for low-rise buildings on sites with difficult ground conditions. Preface. Examples. 1. Site Investigations. 2. Foundation design. 3. Foundations in cohesive soils. 4. Foundations in sands and gravels. 5. Building in mining localities. 6. Sites with trees. 7. Developing on sloping sites. 8. Building on filled ground. 9 Ground improvement. 10. Building up to existing buildings. 11. Contaminated land. Michael Atkinson, CEng, FIStructE, MICE, HND Arb is a former Engineering Manager for the National House Building Council (NHBC) for Northern England, Gerard Studds, Ove Arup, Leeds.